Natter loves to build things. Said things are sometimes of dubious functionality and/or construction, but he puts his whole heart and soul into the effort. 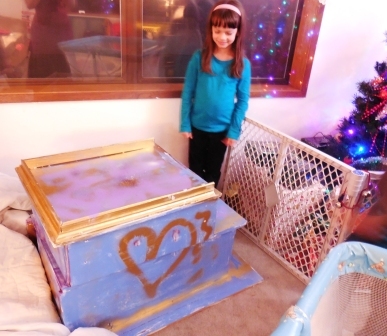 For Christmas, he wanted to build his sister a dollhouse for playing and storage. Given that it was going to (a) reside in the house and (b) probably get climbed on, Daddy decided to oversee the construction and assist in the architectural and engineering departments. Natter and his friend J were hard at work for quite a while. Once the hammering was done, they painted it blue. Then they decided it needed gold accents, and raided the spray paint collection. After that, they decided to use some of the other colors, and write messages like “I Love You” and such on the sides. And curlicues, complete with drips. You never saw two kids more proud of their work! The Great Unveil came on Christmas Eve. If I were forced to give this particular design a name, I think I’d call it something like French-Renaissance-Redneck-Ghetto. Rosebud loves it. She’s quite proud of the fact that her brother BUILT her a dollhouse!! And that it is completely unique! There was a lot of happy-dancing going on here on Christmas Eve in the Kid Department. After they gave J her Christmas present – she loves puzzles – they all had a great time carting it upstairs and arranging all of Rosebud’s Polly Pocket paraphernalia in its new home. 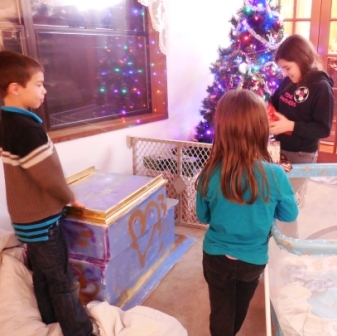 While they have enjoyed all of their other presents, I have to say that the dollhouse – in all of its primitive and gaudy splendor – has been the most satisfying and heartwarming of them all. 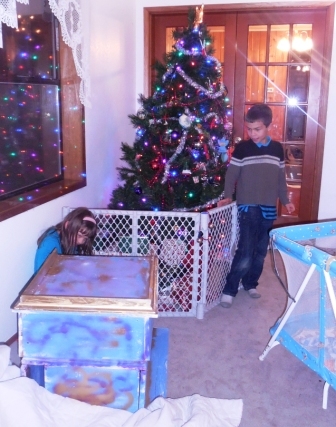 This entry was posted in Projects, The Inmates and tagged brother makes dollhouse, brother makes present, Christmas present, doll storage, dollhouse, homemade Christmas present, homemade dollhouse, Natter, Rosebud. Bookmark the permalink. I love this! One had the fun of building it, and the other enjoys playing with it. Very neat.